it was so nice to have a three day weekend with Mr. Pawlish... and he has a four day weekend this week for Memorial Day! we went and saw Pitch Perfect 2 on Friday and i LOVED it :) i've heard a lot of people didn't care for it, but i think it's awesome. already excited for it to come out on DVD! today i have Lazy Daze from the Dermelect Cosmeceuticals All Decked Out collection to share! (it's a press sample, kindly provided to me for review). it's a beige creme with strong orange undertones... on me, it looks like a bandaid color. it's opaque in two coats, but make sure not to make the coats super thick... it will wrinkle under top coat if it's too thick! it's shiny on its own, but way better with top coat! 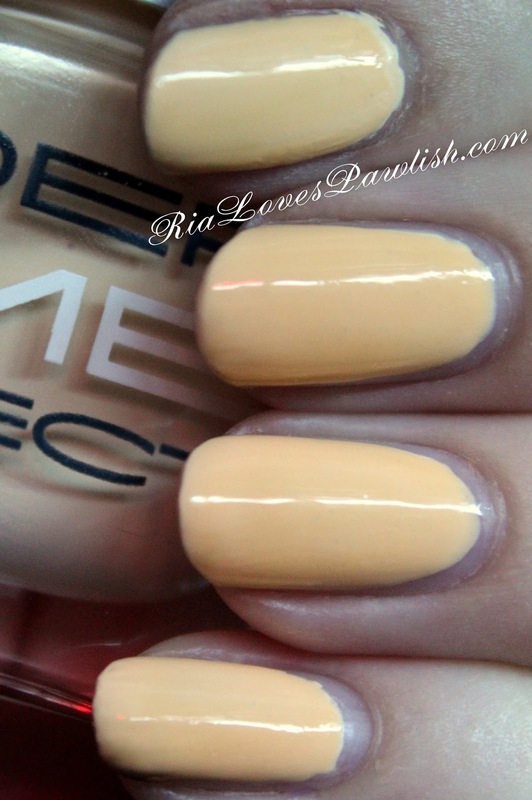 two coats Lazy Daze, one coat Dermelect Memento Manicure Extender Top Coat. (both are press samples). you can purchase Dermelect products at their website, www.Dermelect.com. their color polishes retail for $14, the topcoat retails for $16! i have the other three polishes from the All Decked Out collection to share, and we'll finish off with their topcoat and cuticle oil... so check back often!